Army of Two: The Devil's Cartel is out next week on Xbox 360 and PlayStation 3. I know, it snuck up on me too. If you were looking forward to this bromantic action game filled with explosions, bullets, explosions, and oversized blades (seen above) - well that time is almost here. EA has sent over a new trailer for the game chocked full of explosions and promotional quotes from the game. We revealed some hands on impressions ourselves a few weeks back - let's see if I can find some good quotes to pull from it. ..decided bear on bear wasn't kosher. ...over the top gunfights to tense action..
See! I can pull out of context quotes and make things sound awesome too. Don't worry - what I played of the game was fun, especially if you liked the previous titles. 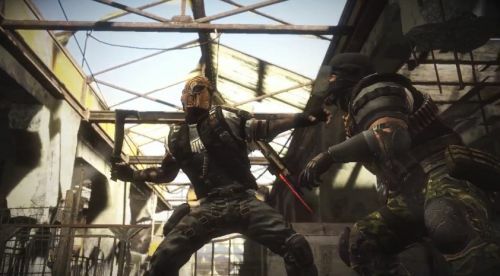 Army of Two: The Devil's Cartel is out on March 26th with two player local or online co-op on the Xbox 360 and PlayStation 3. Page created in 0.3074 seconds.